Deric's MindBlog: What is different about the brains of “superagers”? What is different about the brains of “superagers”? Barrett and colleagues have performed fMRI studies on “superagers” age 60-80, and find that superagers not only perform similarly to young adults on memory testing, they also do not show the patterns of brain atrophy typical of aging in “emotional” (midcingulate cortex and the anterior insula) regions that are major hubs for general communication throughout the brain, serving language, stress, internal organ regulation, and sensory coordination. These are the default mode network well known to be involved in episodic memory function, and the salience network implicated in attention, executive control, and motivational and inhibitory processes integral to memory encoding and retrieval. The authors suggest that the key to maintaining these areas and their function is strenuous physical and mental athleticism, working hard at difficult tasks, whether physical or mental. Superaging signature. 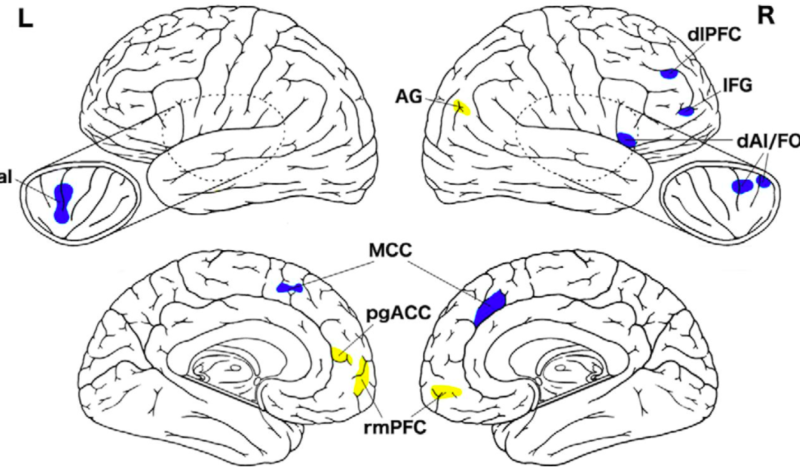 The figure shows key nodes of the salience network (blue) and default mode network (yellow) where superagers and young adults are indistinguishable in cortical thickness. Preserved thickness in these regions is what distinguishes superagers from typical older adults. Decline in cognitive skills, especially in memory, is often viewed as part of “normal” aging. Yet some individuals “age better” than others. Building on prior research showing that cortical thickness in one brain region, the anterior midcingulate cortex, is preserved in older adults with memory performance abilities equal to or better than those of people 20–30 years younger (i.e., “superagers”), we examined the structural integrity of two large-scale intrinsic brain networks in superaging: the default mode network, typically engaged during memory encoding and retrieval tasks, and the salience network, typically engaged during attention, motivation, and executive function tasks. We predicted that superagers would have preserved cortical thickness in critical nodes in these networks. We defined superagers (60–80 years old) based on their performance compared to young adults (18–32 years old) on the California Verbal Learning Test Long Delay Free Recall test. We found regions within the networks of interest where the cerebral cortex of superagers was thicker than that of typical older adults, and where superagers were anatomically indistinguishable from young adults; hippocampal volume was also preserved in superagers. Within the full group of older adults, thickness of a number of regions, including the anterior temporal cortex, rostral medial prefrontal cortex, and anterior midcingulate cortex, correlated with memory performance, as did the volume of the hippocampus. These results indicate older adults with youthful memory abilities have youthful brain regions in key paralimbic and limbic nodes of the default mode and salience networks that support attentional, executive, and mnemonic processes subserving memory function. Do you know if marines or other such groups with this challenge thyself profile have a greater proportion of super agers? I can't help you on that question. Since we would be talking about retired marines, I guess it would depend on whether they continue to challenge themselves in retirement as they did during service.